Construction workers stand-down to learn about fall prevention at a May 7 kick-off event held in the new DC United soccer stadium. 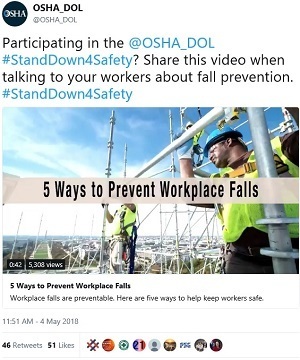 The fifth annual National Safety Stand-Down to Prevent Falls in Construction held events across the country and internationally from May 7 to 11. Deputy Secretary of Labor Patrick Pizzella kicked-off the week in Washington, D.C. at the newly constructed DC United soccer stadium. Thousands of employers held stand-downs during this weeklong event, emphasizing to hundreds of thousands of workers the importance of preventing dangerous on-the-job falls every day. Employers who participated in this year’s stand-down are encouraged to get their certificate of participation and continue to promote fall prevention safety throughout the year. OSHA will hold a meeting June 12 in Washington, D.C., to solicit comments and suggestions from stakeholders in the railroad and trucking industries on whistleblower issues under the agency’s jurisdiction. The meeting is the first in a series requesting public input on OSHA’s whistleblower program. Individuals interested in participating or attending the meeting, either in-person or via telephone, must register by May 29. For more information, read the news release. U-Haul Moving & Storage at Larkin District was cited for exposing workers to silica and asbestos hazards by failing to provide training, respiratory protection, protective clothing, properly dispose of asbestos-containing materials, and have a competent person oversee renovation work. OSHA proposed penalties totaling $108,095. Read the news release for more information. Oldcastle Lawn & Garden Inc. was cited for exposing workers to amputation, struck-by, caught-in, electrical, fall, fire, and noise hazards. OSHA proposed penalties of $251,108. For more information, read the news release. Premier Behavioral Health Solutions of Florida Inc. and UHS of Delaware Inc. were cited for failing to protect employees at their Bradenton, Fla., facility from workplace violence. In 2016, OSHA cited another UHS subsidiary for having a deficient workplace violence prevention program. OSHA proposed penalties of $71,137. Read the news release for more information. 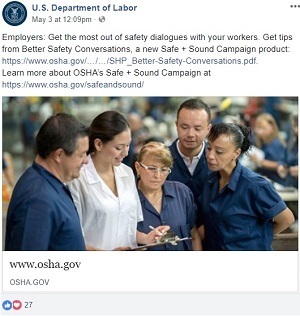 OSHA cited Desouza Framing Inc. for exposing employees to dangerous falls at two northwest Florida worksites. In October 2017, inspectors observed without fall protection. Two months later inspectors saw employees at another jobsite without fall protection, resulting in two willful citations. The Jacksonville-based residential framing contractor faces penalties of $199,178. For details, see the news release. Tennessee OSHA issued 12 citations and $57,750 in penalties to Vorteq Coil Finishers LLC in Jackson after an unguarded pinch point resulted in the amputation of a worker’s fingers. Inspectors found that the employer failed to provide machine guarding, train workers on the control of hazardous energy and confined space hazards, and inspect cranes. California OSHA issued 11 citations and $86,615 in penalties to UMC Acquisition Corp. in Downey after unguarded moving belts and pulleys resulted in the amputation of a worker’s fingers. Inspectors concluded that the company failed to assess the workplace for hazards, ensure that proper lockout/tagout procedures were implemented, and install guards on moving machinery. Georgia-based Jasper Contractors Inc. agreed to pay $48,000 in back wages and compensatory damages to a former safety director who had cooperated with an OSHA compliance investigation. Under the settlement, the company is forbidden from future retaliation and will expunge the disciplinary actions from the employee’s personnel file. OSHA will train the company’s employees on whistleblower protections under the OSH Act. For more information, read the news release. Suterra LLC, a provider of pest control products contacted Oregon OSHA’s On-Site Consultation Program to help improve its safety and health program. Consultants advised the company on chemical exposure monitoring, safe pesticide application practices, and all-terrain vehicle safety. As a result, the company lowered its rate of serious injuries to nearly 60 percent below the industry average, and gained acceptance into the Safety and Health Achievement Recognition Program. For more information, read Suterra’s success story. OSHA, Brasfield & Gorrie, the Associated General Contractors of Georgia, and Georgia Tech Enterprise Innovation Institute are working together to protect 6,000 workers during a hospital construction project in Atlanta. 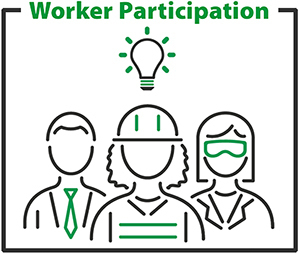 The three-year partnership will focus on preventing work-related fatalities, controlling or eliminating serious workplace hazards, and establishing an effective safety and health program. 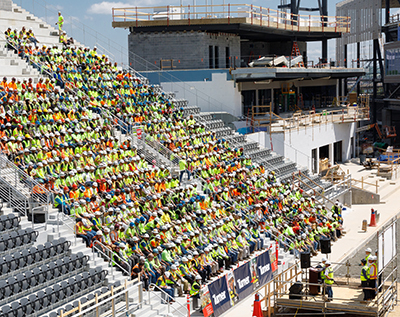 OSHA, the Beck Group and 24 sub-contractors have formed a similar partnership to prevent fatalities, eliminate hazards, and develop a safety and health program that will protect 800 workers during construction of an arena in Ft. Worth. Shipyard work has traditionally had an injury rate more than twice that of construction and general industry. OSHA has many resources that address hazards within the maritime industry, including an online Shipyard Employment tool and a series of 16 videos that examines shipyard fatalities and shows how similar incidents can be prevented.